Chiara is a year old! Friends and family celebrated Chiara’s first birthday today at a picnic in Central Park. The weather was perfect — not too hot, not too cool or windy, sunny but cool in the shade. We staked out a patch in the shade and had a lot of food, and fun. 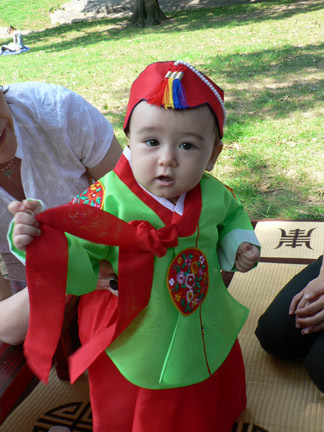 Chiara wore a traditional hanbok, or Korean dress, and was the perfect hostess. So well-behaved. She also looked beautiful. My how she’s grown!